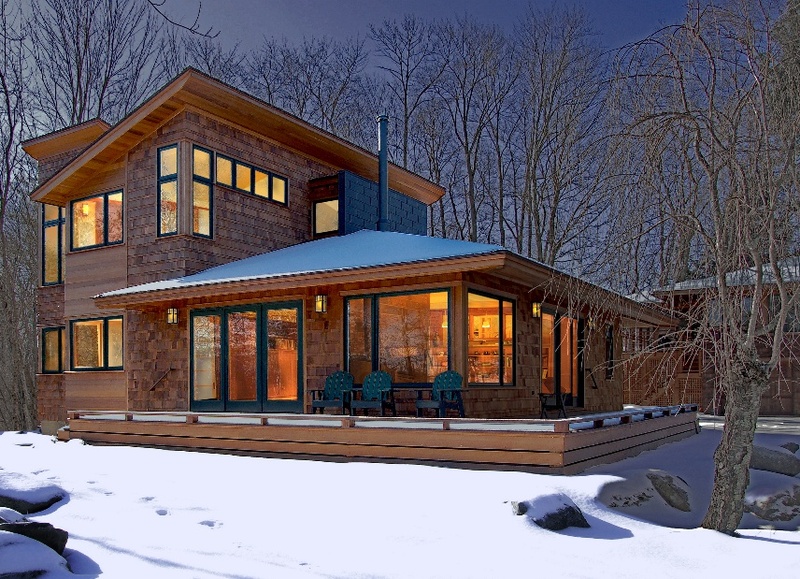 This weekend residence was designed to be a serene retreat from city life. It was also important for it to be energy-efficient and sensitive to the surrounding wetlands. The lofty main living space contained in the low volume on the north side of the house affords lake views while preserving those same views from the second floor of the writer's studio at the rear of site, which was desiged and built in an earlier project phase. A massive stone wall with a rotating wood stove set in front of it serves as a traditional hearth, and sliding shoji screens allow for the living space to expand into the study when desired. Sustainable design elements incorporated into the project include its small footprint (1140 SF) and modest overall area (1640 SF), maintenance of existing vegetation and natural drainage patterns to preserve the wetlands, and an extremely well-insulated shell with reduced HVAC loads. Environmental sensitivity was furthered through the use of sustainable materials and energy-efficient light fixtures and appliances. The shed roof above the two-story volume is optimized for solar PV panel installation at a later date.